Kyne's Challenge: A Hunter's Companion is a short tie-in book to Elder Scrolls Online, which came in The Hero's Guides to The Elder Scrolls Online set. 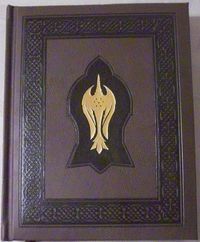 It is a book documenting the journey of a group of hunters as they journey across Tamriel in the hope of slaying each type of beast in Kyne's name. "Unhappy in the extreme, it lifted its colossal club, then dropped it into the heather, hitting the ground with such force I half expected Fenrig to be launched tumbling upwards, through the low clouds to a distant doom." This page was last modified on 8 September 2018, at 07:41.